Café Mambo celebrates the end of its 21st Anniversary year on Friday 9 October. 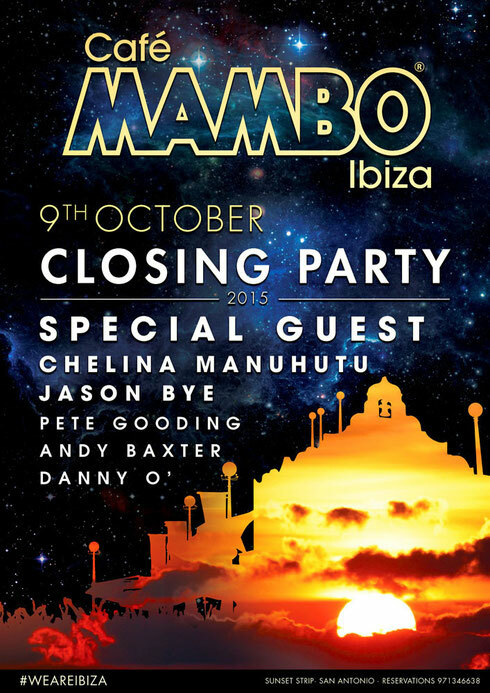 Apparently rounding off its most successful Ibiza season yet, Mambo is throwing one of the last closing parties on the island. The event features summer residents, Jason Bye, Pete Gooding, Andy Baxter and Danny O’, together with guest DJ Chelina Manuhutu and another special guest to be announced. Chelina Manuhutu, the Dutch former model has been playing at Pacha on Sundays, as well as spinning her trademark house and deep techno at some of the Solomun+1 pre parties at Mambo. Also appearing will be longstanding Mambo resident and Pete Gooding. Pete has compiled this year’s album, ‘Café Mambo Ibiza Sunsets 2015’ on UMTV, featuring artists such as The Cure, Grace Jones, Mary J Blige, Jose Padilla, Gilles Peterson, Carl Craig, Skream, Young Marco, Soul II Soul, Womack & Womack, Velvet Underground, Lamb, Vangelis, and William Orbit. The venue recently staged the BBC Radio 1 Weekend again this year and hosted special parties with Fatboy Slim and Duke Dumont. Cafe Mambo also presented pre-parties during the season for Pacha and Amnesia including Together & Defected in the House, Solomun + 1, Aoki’s Playhouse, F*** Me I’m Famous, Martin Solveig’s My House, Bob Sinclar’s Paris by Night and more.